Save Our Sisters, S.O.S, is a community based outreach of Ebenezer Medical Outreach, Inc. aimed at providing education for women of color regarding the importance of breast, cervical and ovarian cancer, three causes of cancer deaths. Natural helpers are the core of this program. They are individuals whom other people naturally turn to for advice and support. The natural helpers in the Save Our Sisters Program are trained in breast, cervical and ovarian health. They work with women one on one and in groups, teaching breast self exams and emphasizing the importance of regular exams. They can also refer women to facilities where screening is available. If a woman is diagnosed with breast, cervical or ovarian cancer, the natural helper is there to be a support for her through her entire treatment and for as long as she needs support. 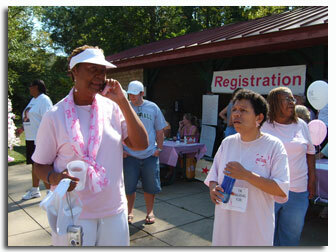 Support for the Save Our Sisters Program is provided by the Avon Breast Cancer Foundation. The West Virginia Breast and Cervical Cancer Program provides free screenings for women whose household income is at or below 200% of the federal poverty level. These screenings are provided at Ebenezer Medical Outreach, Inc. 1448 10th Avenue. Please call (304)529-0753 ext. 107 for more information. 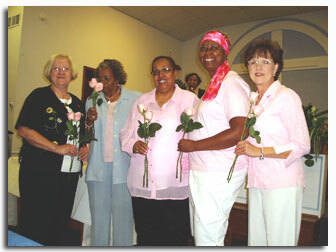 If you are interested in becoming a part of Save Our Sisters call Rebecca Glass at 529-0753 ext. 107. Save Our Sisters is a program of Ebenezer Medical Outreach which provides education for women of color regarding the importance of regular screenings for breast, cervical and ovarian cancer. The program uses Natural Helpers who have been trained as a resource in the community to spread the word and act as an educator for women who may have questions.